. 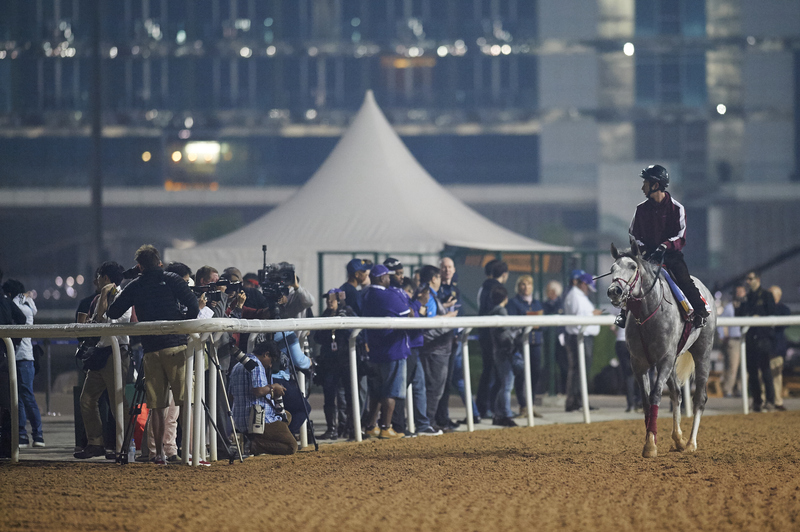 :: DWC 2017 : QUOTES FROM TRAINERS AND JOCKEYS WITH ONE DAY LEFT FOR COMPETITION ::. Special Fighter (IRE) - Fernando Jara, jockey, said: “We are very happy with the horse, how he ran on his comeback and the progress he has made since then. However, from the wide draw it is going to be difficult and we will need some luck. Mubtaahij (IRE) - Christophe Soumillon, jockey, said: “The good news is the horse has improved a lot from his comeback run and seems in very good form. Apollo Kentucky (USA) - Cantered a lap and a half around the dirt course, showing a little speed as they went down the stretch. Assistant trainer Jun Tomioka said: "He worked well. He seems to be loosening up nicely. We will talk to the trainer this afternoon and decide what kind of training we will do tomorrow." Gold Dream (JPN) - Walked for an hour around the quarantine area this morning. Trainer Osamu Hirata said: "We will take him for a light gallop. He is in fantastic condition. We couldn't be happier with how he is coming along." Lani (USA) and Awardee (USA) - Worked together on the main track. Lani cantered for two laps, while Awardee cantered for one lap. They schooled at the starting gate. Arrogate (USA) - Returning to the dirt track for the first time since Monday, when he breezed about 800m. He was greeted shortly after 5am by trainer Bob Baffert prior to a brief visit to the starting gate. Hoppertunity (USA) - Trainer Bob Baffert continues to report that last year’s third-placer seems to be coming into this year’s renewal in the best condition of his life. Opal Tiara - Mick Channon’s filly covered a lap of the main track under regular work rider Lesley White a little after 5am. Vivros (JPN) - Stayed at the quarantine stables and walked for an hour. Trainer Yasuo Tomomichi said: "She has a good appetite and looks well in her condition." Ribchester (IRE) - Put in his latest 5am shift for work rider Matt Ennis, taking another steady canter over a circuit of Meydan’s main dirt track. Mondialiste (IRE) - Given a break from the routine of previous mornings, being switched from the training track to Meydan’s main dirt circuit. Regular partner Danny Tudhope flew in after riding at Southwell on Tuesday and took Mondialiste on a lap of the inner track. Decorated Knight (GB) - Was back on the all-weather training track after a Wednesday breeze along the turf gallop by the side of the main Meydan circuit. He completed a steady 1400m canter. Deauville (IRE) - Took third spot behind Highland Reel (IRE) in the line-up of nine Aidan O’Brien-trained challengers who appeared in public for the first time since arriving early on Tuesday morning. Cougar Mountain (IRE) - Followed immediately in the hoofprints of Highland Reel (IRE), as the Aidan O’Brien team took the track for the first time since leaving the confines of the quarantine barn. Campaigned in the US and Hong Kong at the end of 2016, he comes into Saturday’s race on the back of an unlucky-in-running second place over 1600m in Qatar. Long Island Sound (USA) - Last of Aidan O’Brien’s biggest-ever team at the Dubai World Cup meeting to be accepted by the organising committee, occupied sixth place in the line behind Highland Reel as the squad had their first experience of the Meydan track. “We just cantered but he felt great,” said Buick. “ He’s wearing blinkers for the first time which should help. “It’s a tough race but if things work out for him he should be considered. Sounds Of Earth (JPN) - Trainer Kenichi Fujioka rode him on the way from the quarantine stables to the main track and looked at how he moved before the exercise rider gave him an easy canter on dirt. Highland Reel (IRE) and Seventh Heaven (IRE) - Book-ended the biggest team of horses from Aidan O’Brien’s stable to tackle the Dubai World Cup card, when they appeared in public for the first time since arriving in the UAE on Tuesday morning. Dios Corrida (JPN) - Walked for an hour in the quarantine area this morning. Assistant trainer Yoshinori Unoki said: "He galloped very well yesterday so we didn't want to over work him. He'll be cantered tomorrow." Stallwalkin Dude (USA) - Went through the his final major piece of track work. Howard Jacobson, assistant trainer to father and co-owner David, was on hand to watch the son of City Place blow out 600m, with a pick-up down the lane in 38 seconds. “I very happy with it. He was biting down and wanted to do more, which is what we wanted to see. He really came home and did it all within himself. He’s a professional," said Jacobson jnr. St Joe Bay (USA) - Seeking a fourth consecutive victory for his trainee, trainer Peter Miller kept the routine conservative on Thursday morning. Notlistenin’tome (AUS) - Worked on the dirt track. Jockey Tommy Berry said: “It was quite nice work. He got through the track really well. It’s very deep, you can feel him working on the surface and not just flying over it. But I was very pleased with him, he’s a happy horse and he went through his paces very well." Richard’s Boy (USA) - Walked in the quarantine area on Thursday morning and trainer Peter Miller had conservative plans. Lancaster Bomber (USA) - Was fifth to take his place in the line-up of nine horses from the Aidan O’Brien stable who took all the attention when they appeared on Meydan’s main dirt, making their first appearance in public since they flew in from Ireland on Tuesday morning. Spirit Of Valor (USA)- Was settled fourth in line behind Highland Reel (IRE) as the nine-strong team assembled by Aidan O’Brien entered the public spotlight for the first time, after observing the routine 48-hour quarantine period following their flight from Ireland. The War Front colt has the lightest racing record of the group, with a win and two placings from his three outings as a two-year-old. Master Plan (USA) - Returned to the main track before dawn, galloping under the floodlights. “I thought he looked better today than he did yesterday - I was really pleased,” said Ginny DePasquale, assistant to trainer Todd Pletcher. Epicharis (JPN) - Walked for 40 minutes in the quarantine area. Trainer Kiyoshi Hagiwara said: "We will canter him tomorrow. He is in good form." Adirato( JPN) - Walked him around the quarantine barn. Trainer Naosuke Sugai said: "He is doing great. He just settled right into Dubai, it is really amazing. He is turned on and ready to go. We actually really love having the far outside gate. It fits the horse perfectly. It is the best position we could have hoped for." He Runs Away (ARG) - Came out onto the main track on Thursday morning and went for a strong canter once round the track. Ross (IRE) - Trainer Peter Schiergen arrived on Thursday morning to watch Ross canter once round the track. He said: “Today Ross was a bit hyper, but that was because of all the activities at the track. Triple Nine (KOR) - Arrived at the main track just after 7am. He cantered 2000m as the exercise rider positioned the horse down along the rail. Big Orange (GB) - Cantered on the training track under exercise rider Jill Dolman. “It was just a long hack canter, nice and easy,” said trainer Michael Bell. Handassa (FR) - François Rohaut arrived on Thursday morning to watch Handassa come out onto the main track. He said: “All the prep work is done now. He worked on Tuesday on the grass training track, so yesterday he only did one round of a jog and today, he cantered slowly twice round the track. TM Thunder Struck (US) - Enjoyed a solitary spin around the main track. Ridden by Eric Ventrou, assistant trainer to Alban de Mieulle, he first jogged and then cantered.